Summary: Starting over in Vancouver, British Columbia after a horrific tragedy in their family, Henry K. Larsen is using a journal to explore his feelings and try to adjust to his new normal. His mother is in Ontario trying to put herself back together, and living with his father in an apartment that used to be a crystal meth lab means the house is pretty dirty and they eat a lot of take out. But while they were driven out of Port Salish because of Henry’s brother Jesse’s actions, the people they meet in their new place are different. Henry and his father find themselves supported by their new community, and Henry finds himself with the space to work through his grief in an authentic way. Review: Author Susin Nielsen is unflinchingly honest in her portrayal of Henry K. Larsen, a thirteen year-old boy dealing with life after the suicide death of his brother Jesse in which Jesse killed his bully, Scott, beforehand. Henry’s story has no easy answers, but offers instead a lovable, vibrant main character earnestly working through his grief over the loss of his brother and the dramatic changes in his life. It sounds unbearably grim, but it’s not. The harsh reality of Jesse’s experience as witnessed by Henry is eased by Henry’s unique perspective. His observations of life and others are humourous and poignant. Nielsen brings about a delicate coming-of-age as Henry works through his feelings over all that has happened and begins to let people in again. The good news is Henry and his father are surrounded by people who have also been hurt. Some have lost others, some know what it is like to be an outsider, and others have personal experience with bullying themselves. All are well-drawn characters in their own right. Across this shared pain, connections are forged – strong enough to support Henry and his feelings of grief, anger and sadness even when he lashes out. It is simply a breath-taking read. Nielsen is so completely in the head of a thirteen year-old boy the story itself is seamless. Aspects like Henry talking in a robot voice when he is emotionally distressed and the whole sub-plot of getting to the wrestling match complete the book, and it is one of those stories I will keep re-visiting again and again. Karen and Mr. Atapattu are those people. Their loneliness is like a bad egg fart – you can smell it a mile away. Dad and I, we have a different kind of loneliness. It’s the kind you feel, even when you’re with someone else, because you know something, or someone, is missing. Other lonely people can’t fill the emptiness. Other lonely people only remind you how alone you already are. “It was like Jesse was one person when he was alive and another after he died. When he was alive, Jesse was the babyface. Scott was the heel. But the day Jesse took Dad’s rifle to school, they switched roles. Scott became the babyface and Jesse became the heel. Oh, man. I suddenly get why Cecil seemed so pleased in our last session. I’d been talking about wrestling: he’d been talking about my brother. One big glaring difference, Cecil. “We didn’t for ice cream. We just walked straight home. I remember that Jesse was really embarrassed. And I remember that I was embarrassed, too, because I suddenly knew with total certainty that my brother was not cool. My brother was the kid the other kids made fun of. I think that was the day I stopped looking up to him. I think that was the day I started to feel a little bit ashamed of him. “What I like most about Farley is that he’s like a rubber ball. No matter how hard you throw him, he bounces right back. 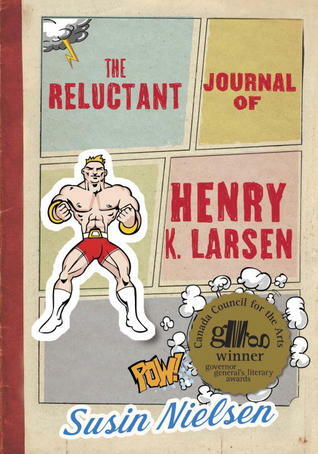 The Reluctant Journal of Henry K. Larsen by Susin Nielsen is published by Tundra Books, (2012).